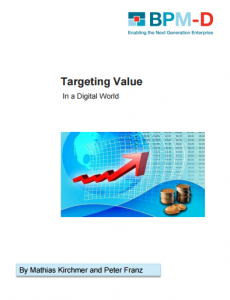 Kirchmer, M., Franz, P: Targeting Value in a Digital World. BPM-D® Paper, Philadelphia, London, October 2014. Extensive research has proven that an organization competes through less than 20% of its business processes that have a high impact on strategic value drivers. Over 80% of the processes are more routine (commodity) processes. It is sufficient to achieve industry average performance in these areas. A value-driven process design and implementation considers this by focusing innovation and optimization initiatives, as well as company specific digitalization, on the 20% high impact processes. Commodity processes are designed based on industry reference models and implemented, as far as possible, through available standard solutions. Design and implementation of processes thus focuses systematically on creating business value. The paper describes an approach to such a value-driven segmentation, design and implementation of businesses processes, transferring strategy into execution, at pace, with certainty in the digital world. The approach is explained using a number of case examples.